Have You Heard About Our Latest Marketing Efforts? | Omaha, NE Real Estate Agents The Bill Black Team Video Blog Omaha, NE Real Estate Agents The Bill Black Team Video Blog: Have You Heard About Our Latest Marketing Efforts? Have You Heard About Our Latest Marketing Efforts? We are always looking for better ways to serve you, so today we thought we would share with you the latest technology we have invested in to serve your real estate needs even better. 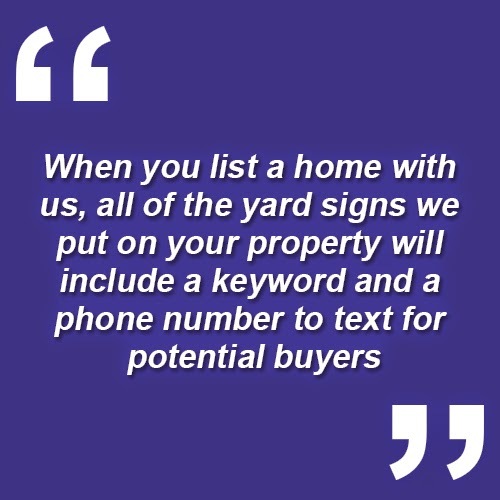 When you list a home with us, all of the yard signs we put on your property will include a keyword and a phone number to text for potential buyers. Once they text the number, they will be sent all the information on your home. Everything from the info and measurements of the home, to all the info available from the MLS, to contact information if they would like to see the property in person. We are always looking for bigger and better ways to market your home, and this is just a start. If you have any questions, or would like to suggest something to us, our door is always open. Give us a call or send us an email, we look forward to hearing from you soon! This is very helpful article for me. I become to know many things from this article. If anyone wants to buy or sale his property with safely you can contact with us. Our website is Online real estate auctions.